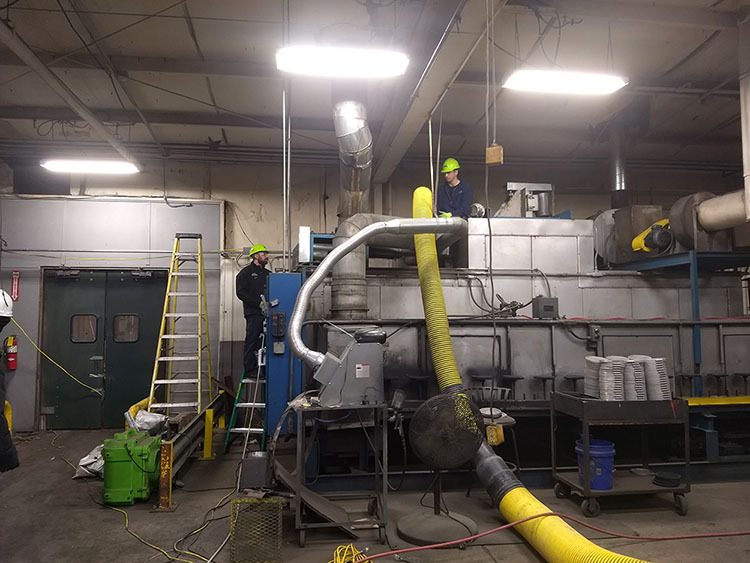 Industrial Duct Cleaning Southeastern MichiganAmistee Air Duct Cleaning is a Professional Leader in Industrial Duct Cleaning in Southeastern Michigan. Whether you are a manufacturing facility, a warehouse, or an industrial building, the Indoor Air Quality of your commercial space is high on the list of priorities. In an industrial environment, specific chemicals and pollutants are released during the manufacturing process. These contaminants can increase in concentration and lead to accumulation in the ventilation system that not only pollutes the indoor air of your industrial facility but it also has negative effects on the health and productivity of your employees. The Technical Manual of the Occupational Safety and Health Administration defines categories for health issues related to indoor air contaminants in commercial buildings including “sick building syndrome” and “building related issues. Without a proper preventative maintenance plan, an industrial building can have contaminated ductwork that pollutes the indoor air quality and effects the safety of the work environment. 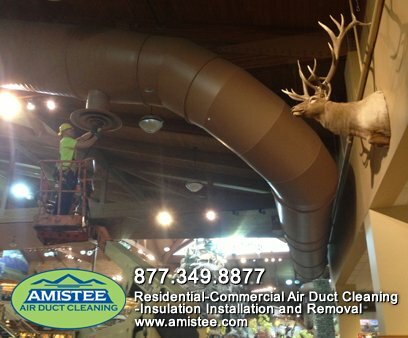 The team at Amistee understands the importance of indoor air quality and is dedicated to providing a thorough and comprehensive duct cleaning that improves the air your employees are breathing. Working in an industrial environment is not for the faint of heart and neither is commercial duct cleaning. It takes technical skill and dedication to work in these kind of environments. Our team is highly-trained in order to understand every aspect of your commercial buildings heating, ventilation and air-conditioning (HVAC) system. We are members of the National Air Duct Cleaners Association (NADCA) because they are the proven authority in air duct cleaning. Each of our team members are trained according to these stringent standards in order to ensure that we are providing a comprehensive cleaning of each component of your industrial building’s ventilation system. They are all put through a rigorous training program at our in-house training facility where they are provided practical hands-on experience that makes sure they are meeting the high standards of Amistee Air Duct Cleaning. We also use the most powerfully advanced equipment in the industry in order to guarantee we will remove anything that has the potential to become airborne. Our specialized air-scrubbing tools and industry-specific compressed air instruments make sure the ductwork is properly cleaned without causing any damage to the HVAC system. Our team follows strict standards to make sure the accurate amount of pressurization is used in each zone of the ductwork and any possibility of cross-contamination is eliminated. All of the debris and contaminants that have collected within parts of your industrial facility’s HVAC system, such as the condenser and evaporator coils, the air handling units, the common air return plenum, the diffusers, and the ductwork will be properly disposed of in our PTO driven vacuum trucks. 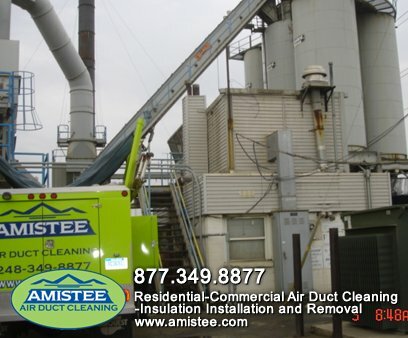 When it comes to a professional cleaning for an industrial facility’s ventilation system, Amistee is the leader in the commercial duct cleaning industry and has both the expertise and the work ethic to provide a duct cleaning you can depend on. 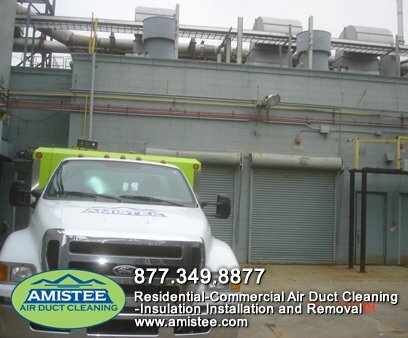 The team at Amistee is dedicated to providing a thorough air duct cleaning of your industrial facility’s HVAC system in order to improve your indoor air quality. We work hard to provide a duct cleaning service that meets and exceeds our clients’ expectations and take every step of our cleaning process into careful consideration. 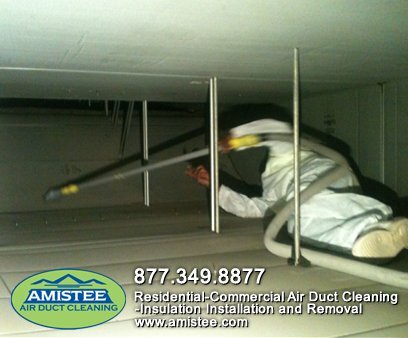 Amistee is a family-owned business that is committed to providing a quality and premium duct cleaning service that members of our community have come to depend on. We encourage you to research our reputation and find out what others are saying about us. We have been featured in several local media outlets such as Crain’s Detroit Business Magazine and the Inside Outside Guys radio program. We have also been the winners of the Super Service Award on Angie’s List and the “Click on Detroit 4 the Best” contest, and have an “A+” rating with the Better Business Bureau. Call Amistee today at 248-349-8877 and find out how simple it is to schedule a free estimate. 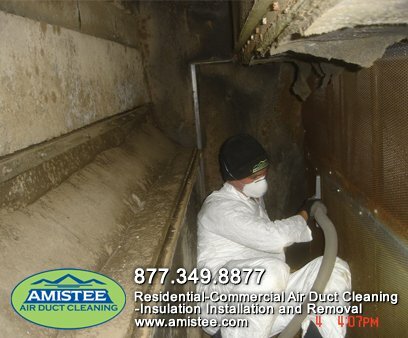 Amistee Air Duct Cleaning is a Professional Leader in Industrial Duct Cleaning in Southeastern Michigan.